Lee Chandler (Affleck) works as a janitor in the Boston suburb of Quincy. He lives alone, he can be rude to some of the residents he comes into contact with (which causes problems with his supervisor), and he picks fights in bars. He’s withdrawn, melancholy, and difficult to get to know. 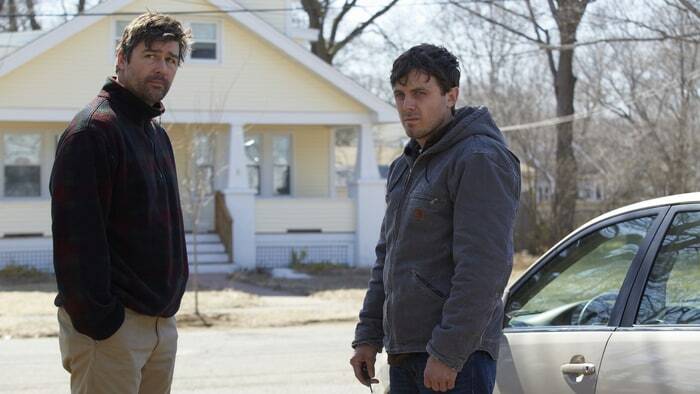 Then, one day, he receives news that his brother, Joe (Chandler), who still lives in their hometown of Manchester by the Sea, has had a massive heart attack. He rushes to the hospital, but by the time he gets there, Joe has died. Lee doesn’t really know how to react, but an old friend, George (Wilson), helps him out and between the two of them, family and friends are contacted, and the funeral is arranged. Joe has a sixteen year old son, Patrick (Hedges). Lee’s plan is to stay with him until the funeral takes place and then head back to Quincy, but circumstances conspire to keep him in Manchester for longer: the ground is too hard for Joe to be buried, so his body has to go into cold storage until the spring, and Joe’s lawyer (Hamilton) informs Lee that under the terms of Joe’s will, Lee is to be Patrick’s legal guardian until he’s eighteen. Accepting the role of Patrick’s guardian means Lee moving to Manchester permanently, something that he doesn’t want to do; the reason he left Manchester in the first place, was in the wake of a personal tragedy, one that he has no wish to revisit by being in the one place that is a constant reminder. While Lee tries to find an alternative solution to being Patrick’s guardian, including Patrick living with him in Quincy, his nephew continues with his life, and appears to be dealing with it all quite well. He has two girlfriends (neither knows about the other), and he spends time with them both, while one of them tries to set Lee up with their mother (Burns). At the same time, Patrick is secretly in touch with his mother, Elise (Mol). She and Joe divorced years before due to her being an alcoholic, and while Lee doesn’t trust Elise because of her past behaviour, when Patrick asks to visit her, Lee agrees to take him. When they arrive they find that Elise has remarried, to Jeffrey (Broderick), and is now a devout Christian. Patrick has hopes of living with her, but the visit goes badly, and later Jeffrey advises against further direct contact between them. When the funeral can finally go ahead, Lee is reunited with his ex-wife, Randi (Williams). She is pleased to see him, but their past keeps him at a distance, and sometime later, when they run into each other in the street, Randi reveals how she truly feels about him after everything that happened. It’s an uncomfortable moment for Lee, but it is his last encounter with her, as a resolution is arrived at as to the question of whether or not Lee will be Patrick’s guardian. There is a moment in Manchester by the Sea that takes place at Joe’s funeral. Lee and George are standing off to one side and greeting people as they arrive. Randi arrives with her new husband, Josh. While Randi embraces George, Lee looks at Josh as if he can’t understand why this man is there, at his brother’s funeral. And then it’s his turn to be embraced by Randi. We see his face over her shoulder, and his eyes are looking away from her, as if by looking away he could actually be away, anywhere else in fact. It’s a small moment, tiny even, but so indicative of Lee’s state of mind: he cannot connect with anyone, complete stranger or onetime intimate. If any viewer is in any doubt about what afflicts Lee Chandler, it’s way beyond everyday ennui; this is almost debilitating emotional sadness, and so profound that you can’t help but wonder how he gets out of bed each day, how he manages to motivate himself to do anything. He’s given up on life, on his future, and worst of all, he’s given up on himself. With that in mind, you’d expect his return to Manchester to be all about personal redemption, that his relationship with Patrick (already well established thanks to a series of flashbacks) would enable Lee to begin to rebuild his life, and to put the terrible tragedy that happened to him and Randi firmly in the past. But this isn’t that kind of movie. By the movie’s end, Lee isn’t transformed, he isn’t “saved”, in fact he’s still very much the same man we see at the beginning, shovelling snow off of the path outside his home. Lee’s journey isn’t one of renewal or acceptance, and it’s not one where his return home provides him with a restorative environment. What’s important to remember is that Lee is living the life he believes is right for him. Is he happy? Clearly not. Is he contented? Probably not that, either. But is he settled? Well, perhaps not even that, but living and working in Quincy – for Lee – may be the best answer he has to what ails him. That said, Lonergan’s hugely impressive script does allow Lee opportunities for rehabilitation, but it also recognises that Lee is someone who doesn’t want them. And as the movie unfolds, and we meet the other characters, we learn that moving on isn’t something that anyone else is able to do with any conviction either. Randi has residual feelings for Lee that she hasn’t been able to deal with; Elise has supposedly conquered her demons thanks to her relationship with Jeffrey but it’s clear her newfound faith doesn’t bear up under scrutiny; and Patrick, who has inherited his father’s rundown boat, won’t sell it because it holds too many memories. Too many times we see instances where regret has taken hold of someone and they’ve not been able to shake it off. And too many times, that regret has settled like a heavy mantle across people’s shoulders. 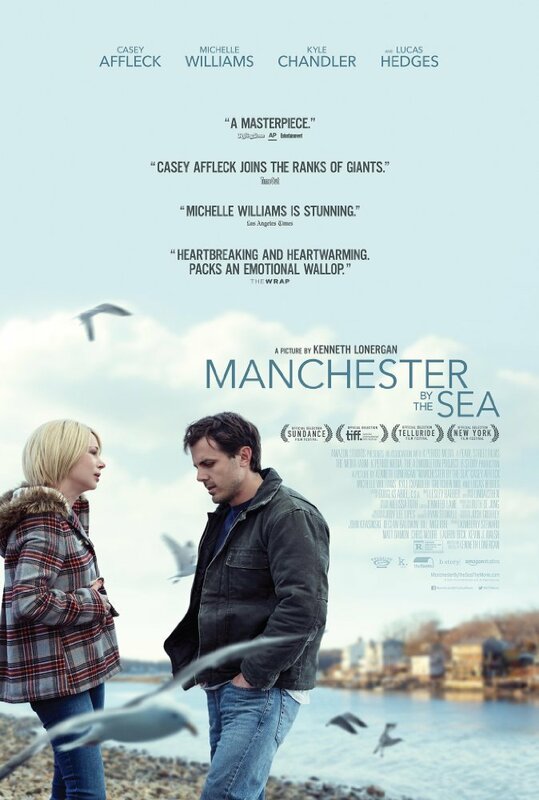 Despite the apparent doom and gloom surrounding Lee’s return home, and despite the themes of guilt, loss and emotional trauma that the movie explores in some depth, Manchester by the Sea is leavened by a tremendously dry sense of humour (at one point, when asked if it’s okay for Patrick to have one of his girlfriends stay the night, Lee replies, “Am I supposed to tell you to use a condom?”). Here, the humour arises from the characters themselves rather than any situational approach, and Lonergan is able to insert these much-needed moments of levity when they’ll have the most effect, making the movie a little less predictable, and a whole lot more enjoyable than expected. Sometimes it requires a delicate balancing act, but Lonergan is as confident a director as he is an intelligent screenwriter, and he handles each comic moment with ease. As the emotionally disabled Lee, Affleck gives the finest performance of his career and of 2016. He was in two other movies in 2016 – The Finest Hours and Triple 9 – and in both he wasn’t allowed to match his talent to the material. But here he gets to provide us with a multi-layered portrayal that makes those movies look like poorly set up practice runs. It’s a largely internal performance, with Affleck using his eyes to powerful effect to display just how disengaged he is from everything around him. He’s equally effective at communicating his grief at what happened in the past, and he achieves this by physically withdrawing into himself at moments when that grief is too near the surface, almost as if he’s trying to squeeze it back inside, or push it down. And there’s a fragility to Lee that’s exposed from time to time, leaving the character with an anguished, wounded expression that Affleck conveys so convincingly you can easily forget he’s an actor playing a role. As Lee’s ex-wife, Randi, Williams is on equally fine form, although she has much less to do and is off screen for two thirds of the movie. However, the scene where she reveals her feelings for Lee is one of the most searing and compelling moments not just of the movie itself, but of any other movie you care to mention. Credit is due to Hedges as well, putting in a mature, richly textured performance as Patrick that highlights the character’s teenage naïvete while also showing signs of the emerging adult that he’ll become. It’s a fearless portrayal in places, brave and audacious, particularly in a scene involving a freezer compartment and a stack of frozen meat that comes out of left field but which perfectly expresses the feelings and concerns that Patrick is experiencing. Elsewhere, Chandler is good in what is very much a secondary role as Joe, while Mol excels as both incarnations of Elise. 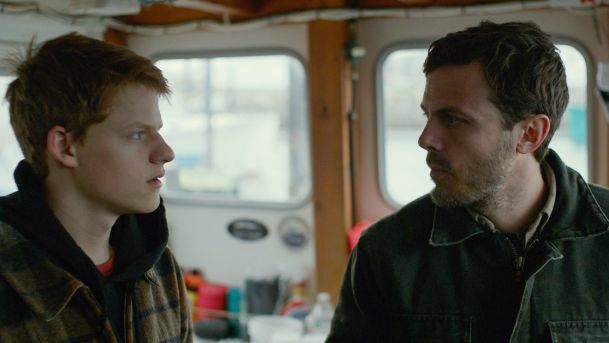 In the end, Manchester by the Sea is a triumph for all concerned, a multi-faceted, engrossing, and surprisingly sweet in places movie that doesn’t offer its characters any easy answers to their dilemmas, and which provides an incredible amount of food for thought for its viewers. It’s a defiantly mature piece of movie making, with a raft of standout performances, a perfectly assembled, nuanced script, and direction from Lonergan that subtly orchestrates and highlights each emotional downbeat and upturn, and which also draws out the varied strands of dismay and bitter experience that keep Lee and everyone else trapped in their own versions of Manchester by the Sea. If it sounds like a tough movie to watch, rest assured it isn’t. Put simply, it’s one of the finest movies out there at the moment, and completely deserving of its six Oscar nominations. Rating: 9/10 – one of the best movies of 2016 – if not the best – Manchester by the Sea is a movie about real people living real lives, and dealing with real and difficult emotions in the best way that they can – and it doesn’t short change them or the audience at any point along the way; funny, sad, poignant, challenging, uplifting, painful, engrossing, bittersweet, and absorbing, this is a movie experience well worth taking up, and which rewards on so many levels it’ll take you by surprise.